The City Stars Mall in the city of Cairo has almost everything under the sun. 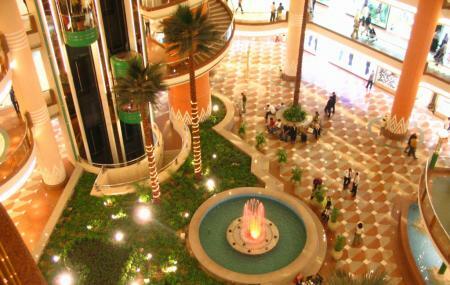 The mall features trending brands, great restaurants, a cinema hall, an amusement park, several cafes, shops and more. If you’re out with kids, this would be an ideal place to spend a part of your day or even the entire day for that matter. Catch a flick, feed that adrenaline rush at the amusement park, or shop till you drop here at the City Stars Mall in Cairo. How popular is City Stars Mall? People normally club together Mosque Of Al- Azhar and Festival City Mall while planning their visit to City Stars Mall. People also prefer to end their day with City Stars Mall. The place is pretty good, and the best part is the new app they have on the play store. Using it you can save your parking, and find any store there, it even uses a location service to give out accurate directions inside the mall. I could find what I need without getting lost for an hour. Off course one the most famous, most elegant and biggest malls in Egypt. Located in a busy area in Nasr City. Hundreds of brands and outlets of all what you imagine. Cleanliness 10/10 Two food courts, coffee shops, cinemas, games and lots of activities. There is a garage for parking your car that is not expensive. Recommended ..
Greet shopping mall. You can find everything in the mall. Many cinemas screen. They have two food courts and some restaurants. It would take you all day to see everything. And they have a kids area. I love it. City Stars seems to be under construction all throughout the mall. Both of the main food courts are now gone, although a couple select eateries still remain. Anyway if one knows anything about Egypt, it's very difficult to find one with a variety of shopping outlets in one location. Also, I couldn't help but to notice the switch of location and upgrade to some of the prayer areas. Awesome! A perfect place for almost everything anyone could want. It has an enormous number of brands to shop from. Whether clothes, cosmetics, perfumes, shoes, bags, jewelry, food, groceries, literally anything that you can think of. There are two large food courts in the mall with plenty of choices to eat from. Fast food and fancy restaurants are available. As well as the separate cafes that are everywhere in the floors. The mall consists of 5 floors. There are also 2 cinemas; regular and VIP cinema. That is apart from the D-box cinema which has active effects during the shows. As for the kids, there is magic planet it’s a place just for kids to play plenty of games and video games and they earn coupons they can exchange for toys. A must visit if you’re staying in Cairo. Also, attached to the mall are two excellent hotels the intercontinental and the holiday inn. Recommend!